CLUTCH and Weathermaker Music have prepared three very special CLUTCH limited edition vinyl collector picture discs. The second in the series Jam Room is available today. The first in the series, Live At The Googolplex was released October 6th. 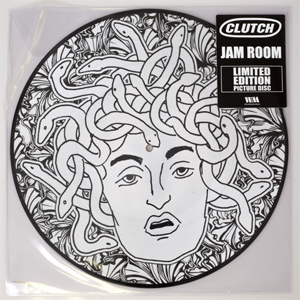 Jam Room is the fourth full-length album by CLUTCH, originally released in 1999. More than any of their other missives prior to this, Jam Room exemplifies CLUTCH's vector into uncharted terrain, both musically and lyrically. The third and final release in the series will be Pitchfork & Lost Needles and will be released on November 24th, 2017. CLUTCH is set to embark on another leg of the Psychic Warfare World Tour 2017 starting November 29th, 2017 and running through December 31st, 2017. All tour and ticket info can be found at: https://www.pro-rock.com. Weathermaker Music and the promoters on the upcoming tour have teamed up to offer 2 free tickets and a copy of the Jam Room vinyl to a lucky winner. Check the club/CLUTCH socials for more info. CLUTCH is currently in the throes of working on new material for a 2018 release.